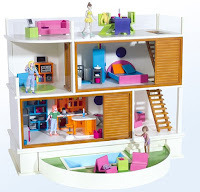 The Dolls House Emporium has released a new range of dollhouses and included is this modern beauty from their children's collection. The Ocean Drive dollhouse is 1:12, features sliding panels and a versatile open floor plan design. It looks good. It does remind me of the Lundby Stockholm 2005 dollhouse with the stairs and the pool/garden component. The Dolls House Emporium offers some colorful children's dollhouse furniture called "Funky Furniture" to use in this house, but I think this structure looks best decorated in more realistic decor. In addition, the new Dolls House Emporium catalogue is available for download on the company website. They have a few new modern items, such as a new red and black kitchen, some modern bar stools, swivel chairs, black shelving and mirrored furniture, etc., etc. 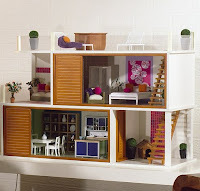 The official news is that this dollhouse has not been approved for sale in the U.S. I will let you know if it ever becomes legal goods. I know, I know---wipe the tears, tip a 40 oz. or whatever you need to do to alleviate the grief and disappointment. Hopefully this will change. To all of my friends in the U.K and Europe, "Lucky ducks!" I was just oggling this over at their website. It ain't bad. But they won't ship to US customers. Alas. Oh hurrah! Are you getting one then? I did a dry run using the $165, 0065, Ocean Drive, Ready to Play CE option. Maybe that makes a difference? Yes, I think so. I am waiting for a response from the DHE to make sure. "We do of course send our house kits and accessories to the USA and will continue to do so for the foreseeable future! On check out of your order please be aware that larger items will incur an extra carriage charge as delivery is by UPS." All systems go, I guess. I contacted Susan as well with what was probably a stupid question, but in the option to buy the Ocean Drive, "built, painted and deluxe decorated" the photograph shows it decorated with the collector furniture. Susan confirmed that when you purchase it fully decorated, you will in fact receive the "funky furnishings". *Sigh* I thought that deal was too good to be true. Hold the confetti. I just tried to place an order and it was rejected. I got a note from the same Susan Coleman saying that the house has not been authorized to sell in the U.S. I guess you better get your European friends to ship it to you. It's not available to U.S. customers. What the FUK???!!!!!!!! I guess I have to make a friend in the UK now. Hey ... just checked Dolls House Emporium to see what's on their (Dec) monthly specials list and there is this good deal on Ocean Drive. You know, they always provide a U.S. price as if you can get it but if you try to add it to your cart, you'll get an error message. The last time I contacted the DHE, they said that they could not say whether it will ever be made available to ship to the U.S. It looks like they do ship to Canada though.